Onto the volcano - Mt.Batur in Kintimani province. 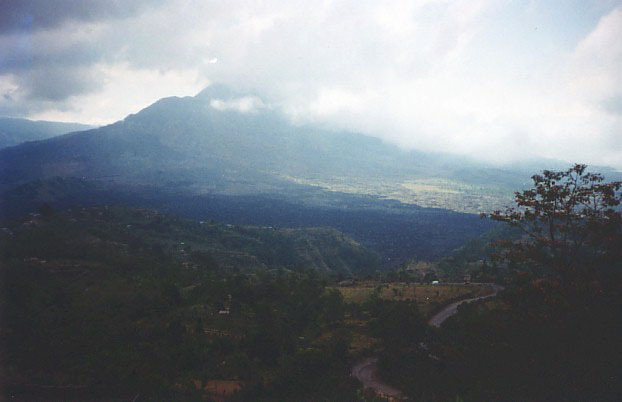 The lookout viewpoint is called Penelokan, and gives a fabulous view over the huge crater, 9km across. 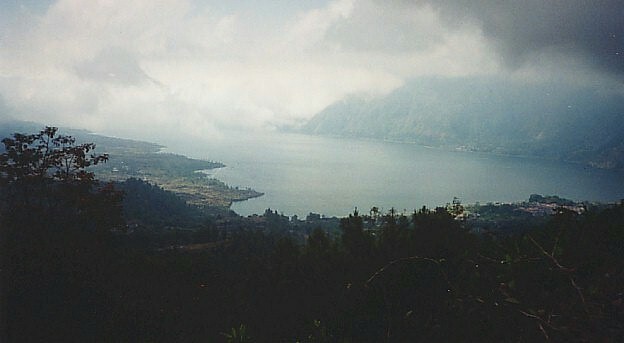 The view ("Penelokan" means "viewpoint") is from the rim of the crater, and looks out across Lake Batur, a huge lake on one side of the crater, the coffee plantations on the other side, and a central cone which erupted most recently in 1973 and which is still smoldering. 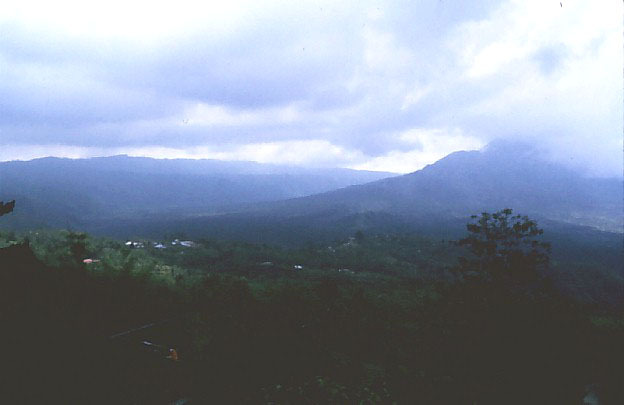 Because of the altitude of volcano, clouds build up around the peaks and the place is permanently overcast, which casts a gloom over the whole area. 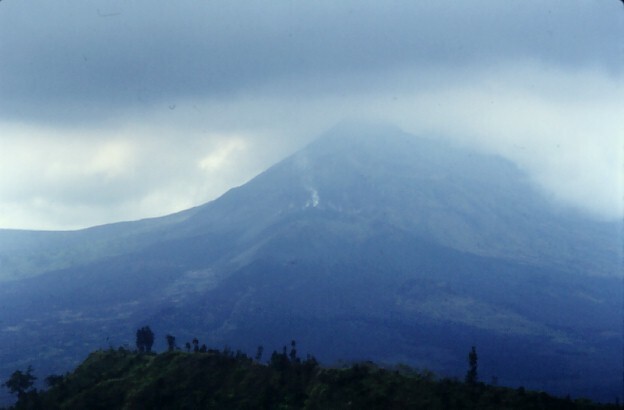 The 1973 eruption left a huge black lava flow across the bottom of the crater. Remote villages like Trunjan on the far side of the lake can only be reached by boat. The people there are the Bali Aga, the aboriginal people of Bali, and live unlike most other Balinese. They leave their dead underneath a sacred tree to rot, instead of burying or cremating them. It's 2 hours across the lake by boat to Trunjan, and everyone we've talked to tells us how awful the place is, full of beggars, and that the boatman will stop halfway across the lake and demand more money. It doesn't sound very enticing. We have lunch at the tourist restaurant at Penelokan - mediocre and overpriced food. 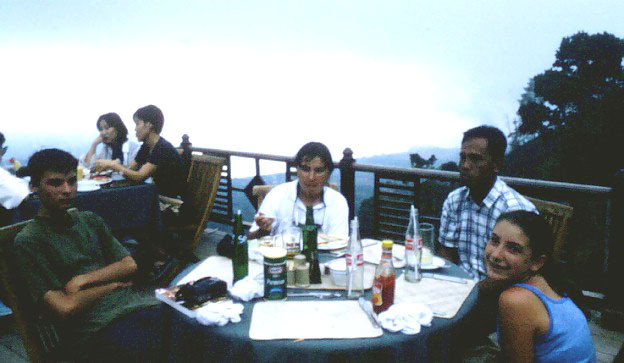 We invite Dewa, who by now we have come to consider a good friend, to join us, and for the first time he accepts. But he seems very uncomfortable sitting at a table with tourists. It's an overcast and gloomy place, and we are all in a gloomy mood. Turned off by the dismal tales of Trunjan we decide instead to drive down into the crater to look at the black lava flows. Dewa doesn't like it here and keeps wanting to turn back. He can't believe Astrid wants to look at "black rock". "Here is black rock" he says. "Why do you want to drive further to look at more black rock?". But we pick up a piece for our collection - it's more porous and crusty than the piece we picked up in Amed from Gunung Agung, which suggests to us that it cooled more slowly. Then back up to the rim - the villages inside the crater seem very temporary, as if they aren't expected to last long. We see several house foundation slabs with no houses on them near a temple. Dewa says that people erect temporary shelters on them during temple festivals, which might last 3 days. The temple itself was destroyed by the lava flow and rebuilt. It's a dark and desolate place. The government is turning this into a "green" area - it's too dangerous to live here. 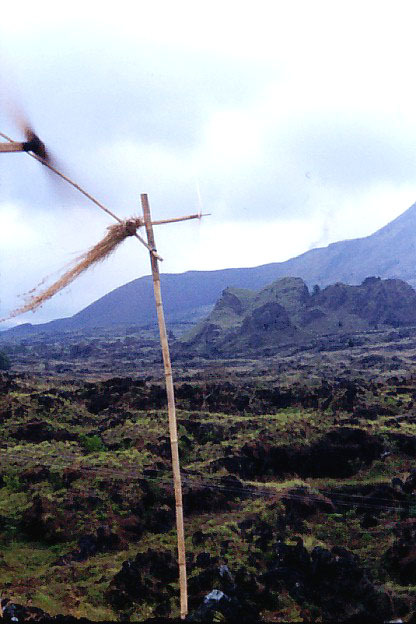 This is a view of the central cone - you can see wisps of volcanic smoke rising from vents in the cone.